BETHLEHEM (Ma’an) — Palestinians are suffering from unfair distribution of water resources as Israel is consuming the vast majority of Palestinian water, Palestinian officials said Sunday. The Palestinian Central Bureau of Statistics (PCBS) and the Palestinian Water Authority (PWA) made the comments in a statement released in honor of World Water Day that underscored the challenges facing Palestinians as a result of the Israeli occupation. The statement underscored the importance of water supplies for achieving sustainable development and highlighted that such development depended not only on the availability of water, but also on its quality, and was ultimately crucial to Palestinians’ economy and welfare. Water resources in the occupied Palestinian Territories come from four main aquifers, but under the Oslo Accords, they are almost entirely under Israeli control. According to the press statement, approximately 104 million cubic meters (mcm) of water was extracted from aquifers in the West Bank for Palestinian use in 2013. Meanwhile, 101 mcm were extracted in the Gaza Strip from its coastal aquifer. Not only are these quantities insufficient, the statement argued that the water is also of poor quality. Water extraction in Gaza far exceeds the coastal aquifer’s recommended yield of 50-60 mcm a year, causing 90 percent of water to fail to satisfy the water quality standards of the World Health Organization, according to the statement. Moreover, seepage of waste water into the aquifers has turned Gaza’s water saline. Across Palestinian households, only 48.8 percent considered water quality to be good in 2013, though this figure was much higher in the West Bank, where 73.5 percent were satisfied with the quality of water, compared to only 5.8 percent in Gaza. 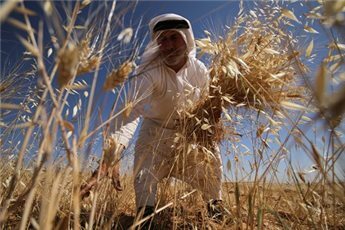 The statement noted that insufficient quantities of available water are also having a negative effect on the Palestinian economy, particularly on the agricultural sector. It pointed out that agriculture is a crucial sector in developing countries as it is the main source of nutrition for the population, as well as the key source of income for the rural population. Approximately 90 percent of extracted water is used for irrigation in the Palestinian Territories, about 20 percentage points higher than the international average. However, the statement said that data from 2011 shows this amount of water was only enough to irrigate 16 percent of Palestinian agricultural land, or 167,671 dunams of a total of 1,034,901 dunams. The statement pointed out that since 1967, Palestinians have been denied access to extract from the Jordan River, depriving them of their right to an estimated 250 mcm annually. In spite of difficulties, the statement said that the Palestinian Authority has increased the number of households with access to improved water and sanitation services. Where as in 2011 about 6.2 percent of Palestinian households had no access to improved drinking water, this figure was 2.5 percent in 2013. Similarly, the percentage of households with access to improved sanitation rose from 51.4 percent in 2008 to 63.6 percent in 2013. However, the Israeli authorities continue to obstruct the construction of a Palestinian waste water treatment plant, denying them the right to benefit from treated water.